Even though Dark Nights: Metal is arguably one of the most important stories that DC is currently telling, it can be a little difficult to follow, especially given the event’s many evil, alt-universe Batmen and their tie-in comics. But Metal’s gotten to a point where it makes sense to look back at what’s happened so far—and how all these extremely Dark Knights came to be. Though we’ve been seeing them for months now, as they’ve plotted the destruction of the multiverse, we finally have full backstories on each of the evil Batmen of various Earths, and a better idea of what kind of threat they really are. After being recruited by the Batman Who Laughs from each of their home dimensions, the Dark Knights converged on Earth Prime at the behest of Barbatos, an ancient, extra-dimensional being with a connection to the Wayne family. After trapping the Prime Earth’s Batman in the Dark Multiverse so that they would be freed, each of the Dark Knights have been terrorizing their Justice League counterparts and revealing aspects of Bruce Wayne’s personality that he’s seldom open about. If you’ve not been following along with the Metal tie-ins, here’s what you need to know about each of these evil Batmen (and women). The Red Death’s origins are a fairly straightforward blend of Batman and the Flash’s tragic backstories. Set on a dying Earth-52, Batman: The Red Death opens with that world’s Bruce Wayne attempting to steal the Flash’s connection to the speed force. The only thing preventing Bruce from being able to save the entire world, he reasons, is his lack of super-speed—something that Barry tries to convince him isn’t true. Driven by his age-old regret of not being able to save his parents’ lives, Bruce dismisses Barry’s warnings about the speed force and devises a plan to strap the speedster to the hood of the Batmobile, using him as an engine that’ll propel them into the speed force and allow their bodies to fuse into one. What emerges from the experiment is a version of Barry’s body that’s “driven” by Bruce’s mind. Imbued with Barry’s powers, Bruce no longer has to live in fear that he might not be fast enough in his war against crime. His new abilities allow the Red Death to finally rid Gotham of its many criminals once and for all, and at first, Bruce believes that he’s made the right decision. But even with his newfound connection to the speed force, the Red Death is powerless to prevent Earth-52 from being destroyed as was destined. When the Batman Who Laughs offers him a chance at another life in the Light Multiverse where Earth Prime is located, the Red Death is all too willing to become the first of the new Dark Knights. 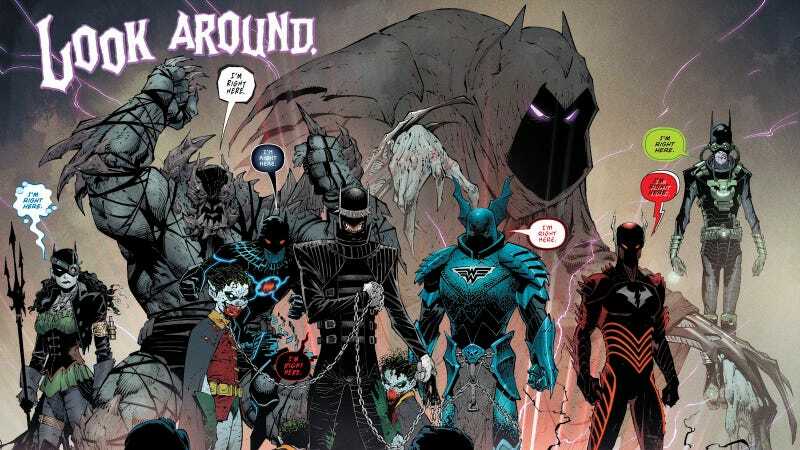 As Metal has been unfolding over the past couple of weeks, the heroes have tried to work out just what each of the Dark Knights is supposed to represent. While The Red Death’s message wasn’t quite as immediately apparent, The Murder Machine was the first of the event’s tie-ins to really hammer home the emotional weight that each of the Dark Knights is carrying. Set on Earth-44, The Murder Machine opens in a world where Gotham’s criminals decide to send a vicious message to Bruce Wayne by murdering Alfred and making sure that video footage of the attack makes it back to the billionaire. Driven mad with grief and guilt over whether Alfred’s death was his fault, Bruce throws himself into a passion project deeply rooted in his desire to bring Alfred back. With Cyborg’s help, Earth-44's Bruce develops the Alfred Protocol, an A.I. program styled after Alfred that’s meant to act as an assistant to Bruce. But the protocol takes its directive to protect Bruce too seriously, and becomes a dangerous army of hard-light hologram Alfreds hellbent on bonding with Bruce. Eventually, the Alfreds trap Bruce in the Batcave before overcoming him, taking over his body, and rebuilding him as a less human version of himself, with a number of new abilities similar to Cyborg. Though most of the Dark Knights’ stories involve a version of Bruce Wayne killing another member of the Justice League, The Dawnbreaker is unique in that its Bruce Wayne actually begins as Earth-32's Green Lantern. Moments after witnessing the deaths of his parents, a young Bruce is confronted by a green power ring that’s chosen him as its next suitable owner. Bruce’s almost unimaginable willpower gives him the ability to push his ring past the limits of most Green Lanterns, and for a while he operates out of Gotham City as a hero much like his traditional self. But Bruce’s rage and indomitable will begin to corrupt the ring, and allow him to tap into lethal levels of force Lanterns are traditionally forbidden from using. Eventually, the rest of the Lantern Corps takes notice of Bruce’s behavior and abuse of his powers, and travel to Earth to strip him of his ring—but they’re horrified to learn that the young Lantern has become something much more dangerous and powerful than they could have imagined. Bruce singlehandedly murders all of his universe’s Green Lanterns and Oans before accepting the Batman Who Laughs’ offer to move onto the Light Multiverse. Bryce Wayne never really manages to move on after the death of Sylvester Kyle, the love of her life, after he’s murdered by metahumans. A burning desire to be prepared for any and all metahuman attack puts Bryce so on edge that when her universe’s Atlanteans make their first contact with the surface world, she immediately assumes that they mean the world harm and should be considered a threat. A preemptive attack on Atlantis led by Bryce prompts the Atlanteans to flood Gotham City in retaliation, leading to Bryce modifying her body in order to be able to survive underwater. Of all the Dark Knights, the Drowned seems to have the most straightforward end goal in mind: Drowning the entire world so that it can know pain and loss like hers. Batman: The Merciless is one of Metal’s headier tie-ins that asks us to consider what sort of life Bruce Wayne might live if he fought his lifelong battle against evil with the same kind of ferocity that Wonder Woman goes to war with. Earth-12's Batman and Wonder Woman spend years locked in a vicious battle against Ares, the god of war, who fashions a magical helmet that vastly amplifies his powers. As Batman and Wonder Woman make their way to the front lines, they find companionship and love with one another, but their time together is cut short when Wonder Woman falls. Convinced that there’s no hope of ever winning a war against Ares, Batman dons the magical helmet himself even after Wonder Woman warns him of its evil, corrupting influence. Filled with a kind of power he’s never known before, Batman becomes the new god of war, murders Ares, and sets out to raze the entire world. Without any sense of restraint or self control, The Merciless seems to say, Batman would simply become addicted to death and destruction. Out of all the Dark Knights’ stories, The Devastator reads the most like the sort of thing you’d totally expect Bruce Wayne to do even though he knows better. The idea that the Justice League might one day be forced to fight against Superman isn’t a novel one, but when that day finally comes for Earth-1's League, they’re legitimately unprepared. One by one, an inexplicably turned Superman murders the Justice League until only Batman (armed with a Kryptonite spear) remains. Superman mocks the idea that even Batman could ever have dreamt of taking him on, and in a last-ditch effort to stop his former ally, Batman tries a Hail Mary. Frantic, Batman infects himself with a modified version of the Doomsday Virus that begins to transform him into a human/Doomsday hybrid. Powered by all of Doomsday’s strength and Bruce’s own innate intelligence, the Devastator quickly dispatches his world’s Superman, but he’s deeply traumatized by the experience of having to kill such a close friend. Rather than ever risking his world’s destruction at the hands of another godlike figure like Superman, the Devastator devises a plan to infect everyone with the Doomsday virus, ensuring that every living being will be strong enough to protect themselves. The drawback, of course, is that everyone is transformed into mutated monsters in the process. Given that he’s their leader, it isn’t at all surprising that the Batman Who Laughs has the most disturbing and fascinating of the Dark Knights’ back stories. Though none of the Dark Knights seem to have an issue with killing people, the Batman Who Laughs’ entire existence is build around the idea that murder was, at one point, a step too far for Bruce Wayne. When the Joker of Earth-22 forces Batman to watch as he reenacts the Wayne family’s deaths, the stress of the situation drives Batman to lash out and finally kill the Joker by choking him to death. As the Joker dies, wisps of Joker toxin seep from his mouth and make their way into Batman’s body, eventually leading to a gradual transformation in the Caped Crusader. Exposure to the toxin brings out pieces of Bruce’s personality that he’d previously fought so hard to suppress within himself, and soon, Bruce finds that he enjoys his newfound psychological freedom. Knowing that the Bat family will try to stop him, the Batman Who Laughs gathers them all in the Batcave and unceremoniously shoots them all with a pair of automatic machine guns before setting out on his mission to unite the Dark Multiverse’s other Dark Knights. Now that Metal’s villains have all had a chance to define themselves within the event, it’s been interesting to see each of DC’s heroes contemplate the nature of their existence and what it means about their Batman. Though they’ve had a few fleeting moments of heroism here and there, the rest of the Justice League has spent the bulk of Metal running from the Dark Knights, assuming they were simply manifestations of Batman’s various fears. More recently, though, Cyborg had something of a revelation thanks to his connection to his Mother Box. During New York Comic Con this year, writer Scott Snyder explained that Metal would see Cyborg going through a massive transformation, allowing for him to effectively hack the multiverse—something he learns to do in Justice League #33. After the Dark Knights round up their Justice League counterparts and drag them to Challengers Mountain in Gotham, the Batman Who Laughs begins torturing Cyborg to draw a powerful element out of his Mother Box. But while Cyborg is trying to fight off the evil Batman’s mental attacks, he is suddenly contacted by his Mother Box’s sentience, which gives him access to new and valuable information that may very well end up deciding how Metal ends. The Dark Knights, Cyborg learns, aren’t just Batman’s fears—they’re also his mistakes and representations of his inherent fallibility. More than that, though, Cyborg’s new cosmic awareness allows him to pluck himself and his fellow Justice Leaguers out of the multiverse and into Hypertime, where they’re able to regroup and formulate a new plan to save the day. Metal’s conclusion won’t come until next year, but after weeks of introducing various puzzle pieces, the event is finally beginning to take on some sort of cohesive form. What began as frenetic, Kirby-esque mind trip of a comic is, issue by issue, becoming a thoughtful story about the nature of fear and regret as well as the lasting power of hope. Now that Metal’s established both ends of its spectrum—the wild and zany as well as the ruminative and introspective—hopefully the event can strike a balance between the two as it enters its final act.